A naked bald woman walks down the thoroughfare of a government facility in Metropolis. A security guard pulls her aside, telling her that she needs to be dressed, and she introduces herself as Lena Luthor, demanding the full rights of a human being. Jimmy, on the Rail Whale, is surprised when it stops. The Rail NEVER stops. Lena is questioned in the police department. She tells them that she really is Lex's daughter, and to get a hold of Jimmy Olsen. At a press conference, Jimmy and Lois watch as the Mayor tells the people that they've lost contact with the tech. Jack Ryder starts to lay into the mayor, accusing him of being a puppet of Lexcorp and using the tech to bring in tourists while KNOWING that he couldn't control it, simply because they had Superman. Jimmy says that this is a lie, that Lena is not insane or losing control. Lois tells Jimmy that Lena is at the police station, and that she wants to see him. Jimmy goes and picks her up, telling the police that she is his crazy cousin. Lena ruminates on the complexity of the human body and the wonder of sensation, feeling cold, touching a ladybug. Jimmy takes her home and offers to get her something to eat. Lena agrees. On the way, she tells Jimmy she plans on staying human. A car nearly runs her over, and Jimmy shoves her out of the way. All of the lights are green. At the diner, Lena orders all of the food on the menu until Jimmy stops her. He asks her what will happen if she stays human. She tells him that the city was always meant to be human. She asks if he will stand by her. He puts his hand on hers, and she starts to feel heat. She asks why. Jimmy has a suspicion. It starts raining as they walk home. Jimmy tries to pull Lena under an awning, but she refuses, feeling the rain. Later, they talk about love. Is this love, she asks? He says it is good, bu t he doesn't know if it is love. Superman arrives. With Lena Luthor. The baby. He explains to Lena the robot that she is just a copy of the real child. It devastates her. Jimmy pointedly asks Superman to leave. Lena, in despair, disappears. The city returns to normal. Jimmy's watch speaks, and he's crying. Story - 5: I have great news, folks! I have to make myself a hypocrite. I ripped the last issue of the series, saying that things were going downhill. It has ceased. I am wrong, I am WRONG, I AM WRONG! And it makes me happy. This is the best issue thusfar, and I would suggest, one of the best Superman books in recent memory. This does not retract what I have said about the general direction of Super-books, which I think needs work, but this book, man, this book SHINES. Now, if the other books could hook into this energy, maybe be a part of it...then we're talking. Why couldn't this be under the Man of Steel heading? It's good enough to be an ongoing...THE ongoing. Last issue stank, comparative to the rest. I stand by that. But this one? Heck, I fell in love with Lena. I felt for Jimmy. The characters, for once, were HUMAN. Real. Comic extrapolations of the world we know. What makes comics good. I was a bit aback when the preview for the next issue said, "He ain't Superman's PAL no more!" Why? Well, if I'd read that in the preview for any of the other Super-books right now, I'd think they were just making Jimmy rude and mean because it would get readers. Now, with this series, look. A VERY good reason. A VERY VERY good reason. This is how it should be done. It's like I was saying, talking about Adventures of Superman #618 with some people. Mxy can go bad. Generally, he shouldn't. But if there is GOOD REASON? Heck, why not? There was none for #618, for this, heck, taking the love of my life would make ME turn against Supes. And Jimmy is a lonely, put-upon kind of guy. Art - 5: The story is great, but it wouldn't be the half of it without the art. 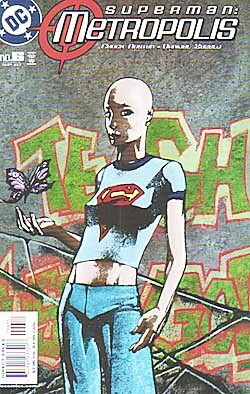 I'm still digging the "real world" of Metropolis, and Lena, well, I'm usually not into bald chicks, but face it. She's hot. For a... cartoon. Geek alert. BWOOP! BWOOP! The man is going too far! Attraction to a cartoon=unhealthy! Seeking counseling. Seeking counseling. Cover Art - 5: THE TECH THINKS THAT THIS COVER IS A VERY AESTHETIC VIEW OF OUR COUNTENANCE. WHILE NEAL UNDERGOES THERAPY WE WILL BE TAKING OVER THE REST OF THIS REVIEW. BUTTERFLY SYMBOLISM RESONATES WITH THE HUMAN BRAIN. THE TECH IS SUCCINCTLY GRAFFITIED ON THE WALL...VERY AESTHETIC. THE LOGO IS NICE. BALD IS BEAUTIFUL. THAT IS ALL.